I am so lucky to have good friends. The type of friends that know the moment they see an old vintage church pew for sale on a Facebook yard sale site, they must tag you in it ASAP. I have such a friend that did this awesome gesture. Within minutes, I had secured myself a sweet new(old) piece of vintage farmhouse goodness. 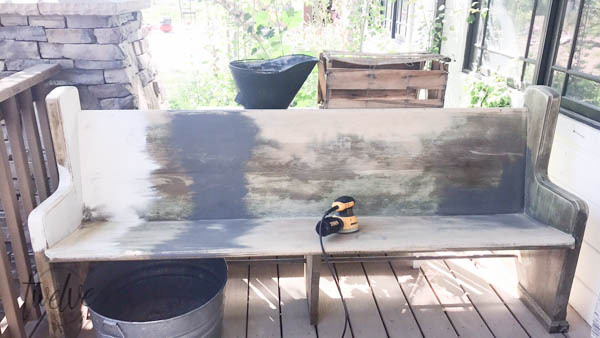 And this post my friends is how this church pew took a journey, into the gorgeous farmhouse style painted church pew of my dreams. About a week ago, I reached out to my readers and followers on Facebook and Instagram, wanting all of your awesome opinions on what color I should paint it. 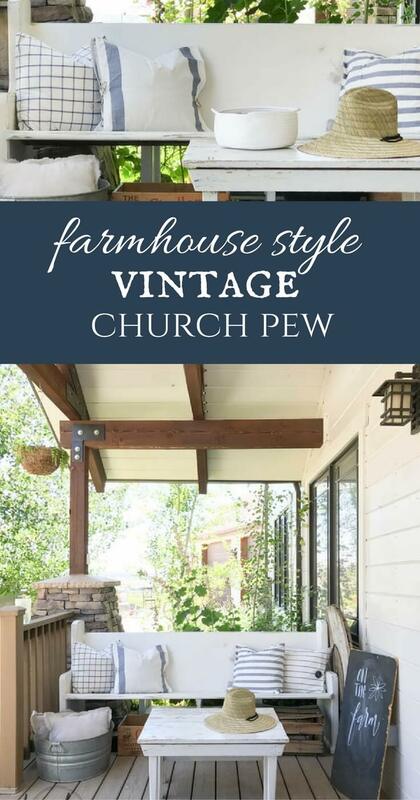 I had initially wanted to sand it down and give it the same raw finish as my other vintage church pew that resides in my entryway and my barn doors in my breezeway. You see, this new church pew was in dire need of some help. The varnish on it was peeling off all over the place, but the weird thing was, that the varnish had a weird greenish hue to it, and once the varnish had been sanded off, the green was stained deep into the soft parts of the wood grain throughout the whole church pew. I spent hours sanding, bleaching, using peroxide, and deck cleaner trying to get the weird green out, with no success. I finally decided that I would paint it, which I was just fine with too. So with all that said, my readers were so awesome to give me tons of ideas. I was jumping from painting it white to painting it charcoal. Quite a difference. My gut told me I wanted it white, but I decided to try out some different colors in hopes that it would create something I never knew I always wanted. 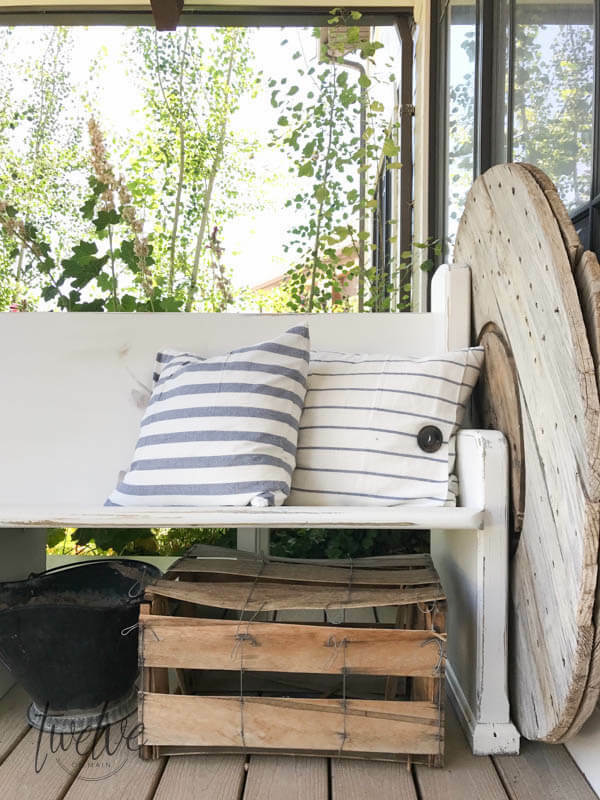 Here is my vintage church pew sitting on my porch painted with different samples. And another once I realized keeping the raw beauty of the wood was not an option. I painted most of it white, and left one side a charcoal blue. I styled them up just a bit, hoping to find some inspiration. My brain kept gnawing at my that I should listen to those that said it should be charcoal, but my heart and my whole body wanted it to be white. So white it became. 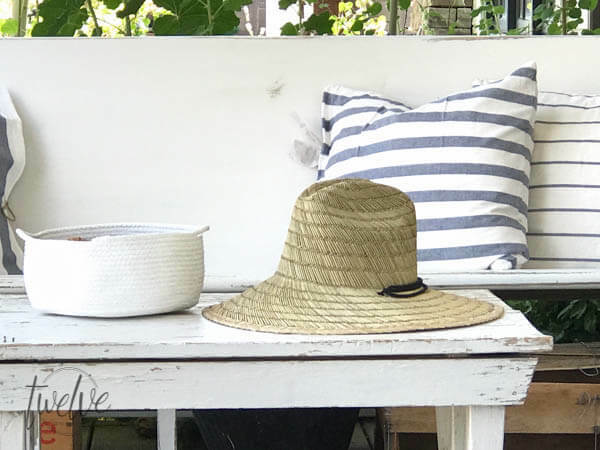 A few reasons why I chose to paint my vintage church pew white. Ummm, well, it goes perfectly with just about everything else I have in my porch/home decor. 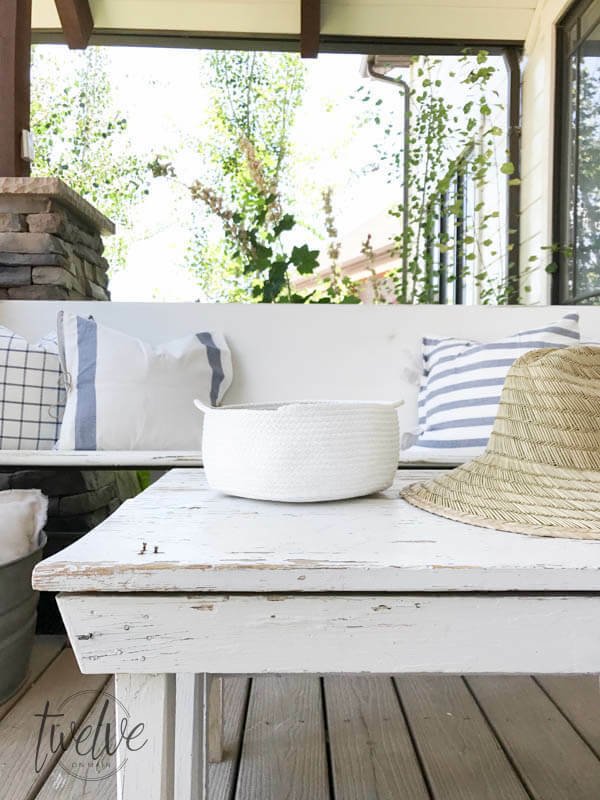 White is the epitome of farmhouse style, and I have always envisioned a white church pew on my porch. I just have. Also, I thought about different seasons of the year, and thought about the seasonal decor that I have, and I decided that they would all look best with a clean white church pew. 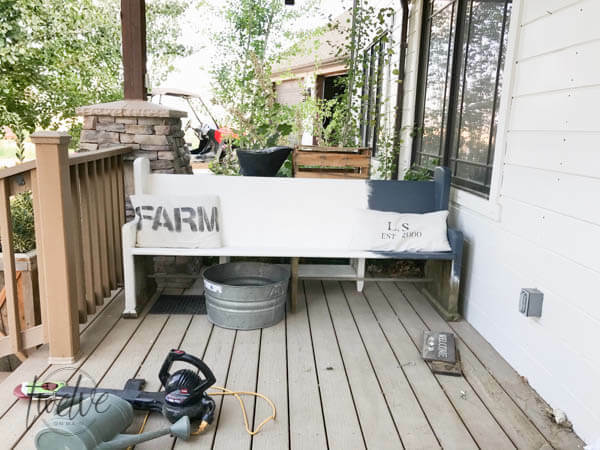 A farmhouse style painted church pew. Can you imagine how lovely my Christmas and winter decor will look? What about fall! Oh man I am so excited! For now, I will pretend we are in an extended summer. How and what I used to paint my church pew. I decide to use some paint I already had sitting in my garage. It is the same paint I used for my master bedroom remodel, so I knew I would love the color. I started by painting one coat on the entire surface of the church pew. I then moved to the back and painted it while the from was drying. 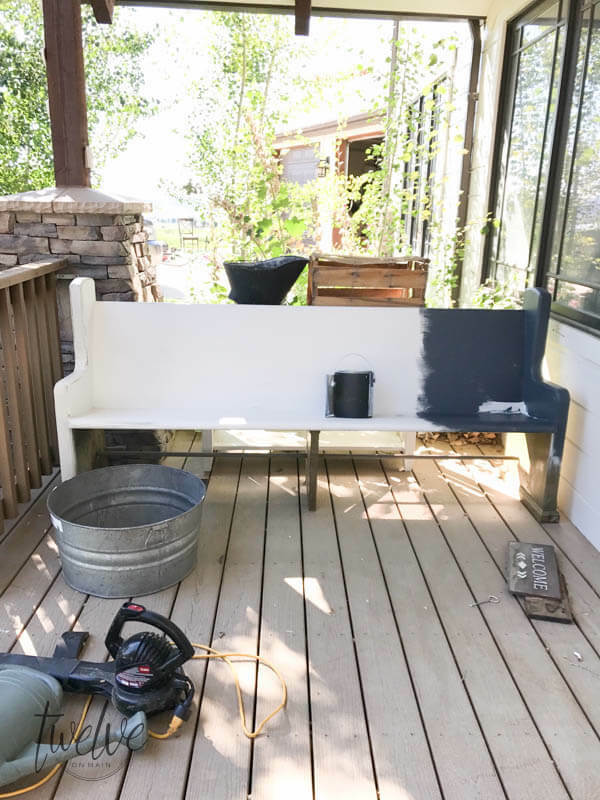 Once the front was dry, I added one more coat, to complete the farmhouse style painted church pew. I let the whole piece dry for a few hours before I started to antique it. I used my sander to antique the church pew and give it a roughed up look. It needed to look like it had been used and abused a bit. 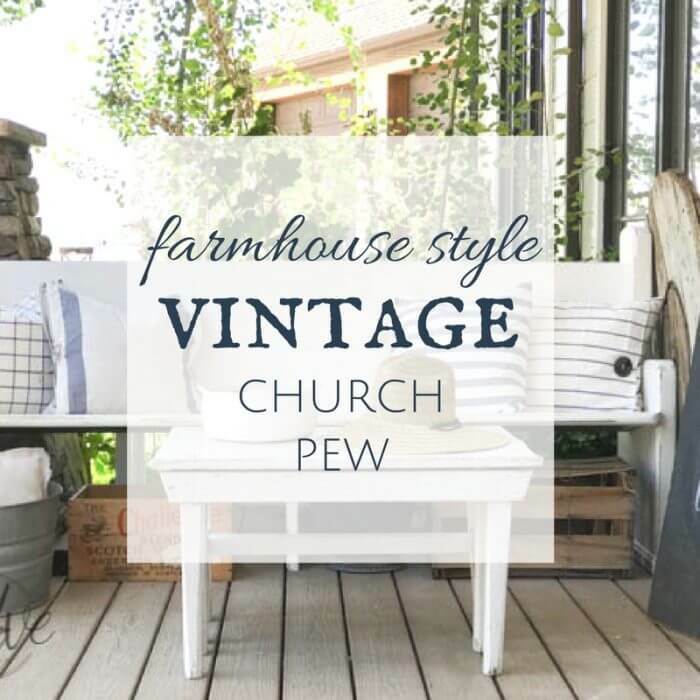 How to style/accessorize a farmhouse style painted church pew. One very important element to add to any old church pew is pillows. Since the church pews are completely wooden, it is nice to add some softness to them. 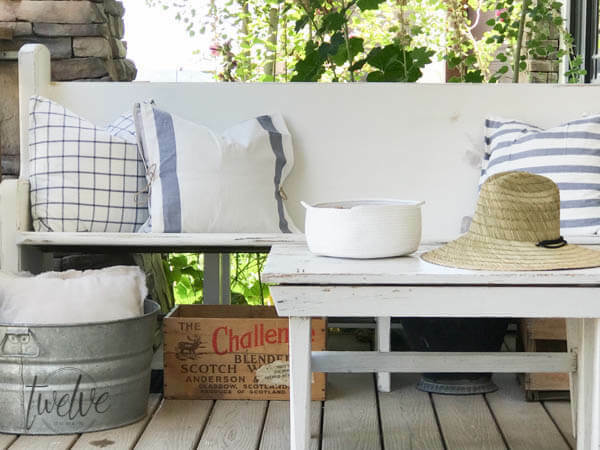 I added these farmhouse style striped pillows that I made(which will be in a tutorial soon). I love the touch of blue that the pillows add to the church pew. I tend to like to add my few colors in my accessories, which is what I did here. 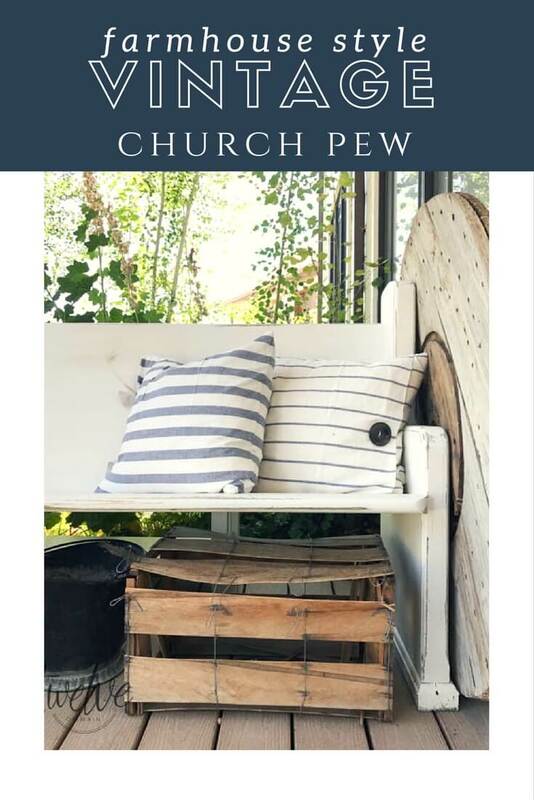 Another great way to style a farmhouse style painted church pew is to add baskets, crates, or other wooden boxes underneath the pew. There is a large space under the church pew that can be used. Take advantage of it. 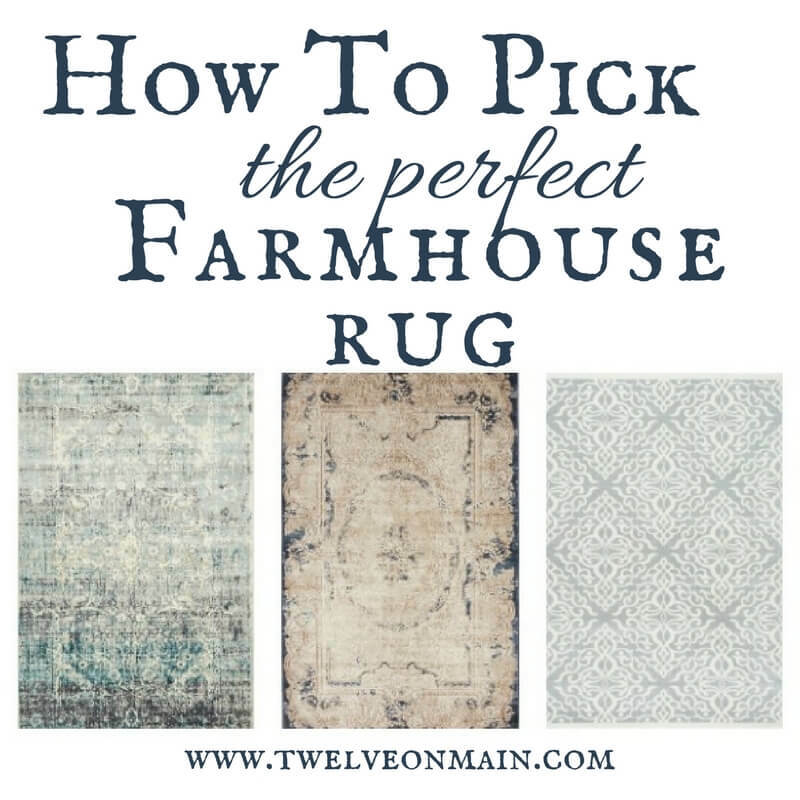 Its a great place to add farmhouse style. 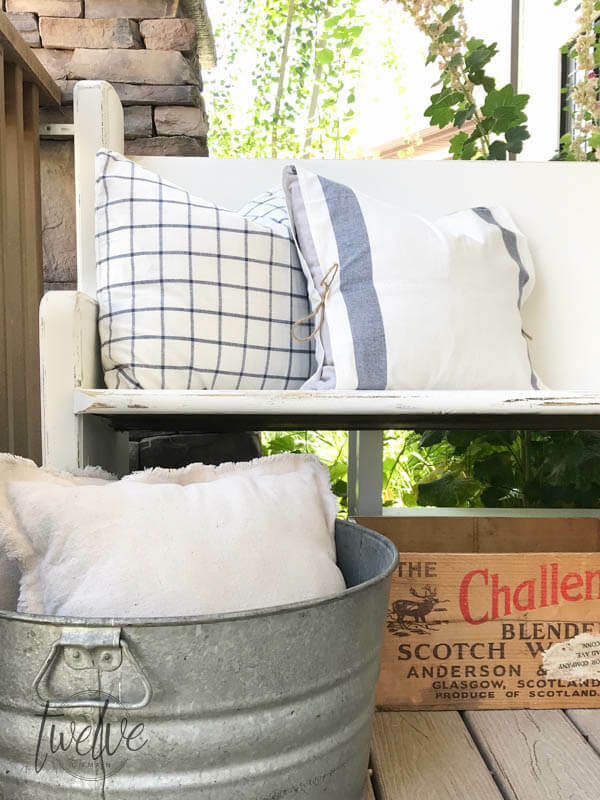 I also added a galvanized tub full of pillows in addition to my crates and wooden baskets. Otherwise, the church pew just looks a bit empty to me. 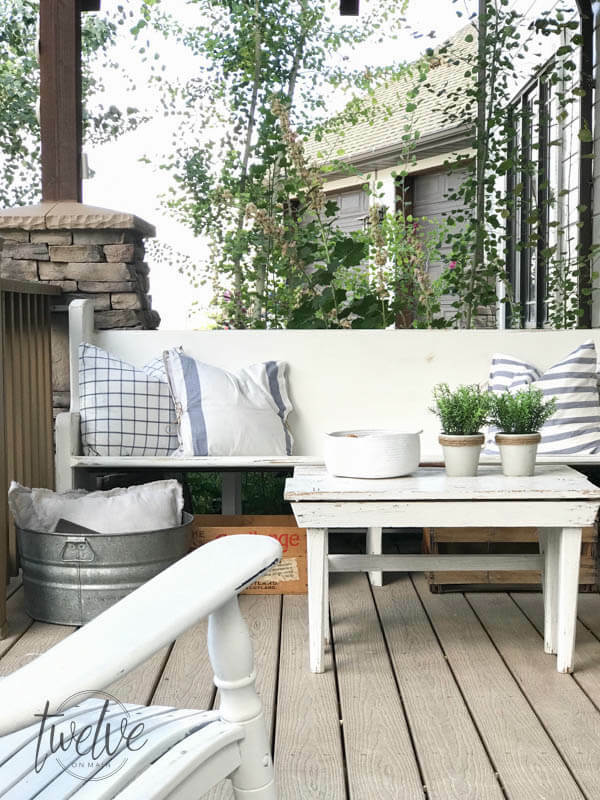 Since I had plenty of space on my front porch, I decided to add a few chippy white benches, doubles up, as a coffee table of sorts. 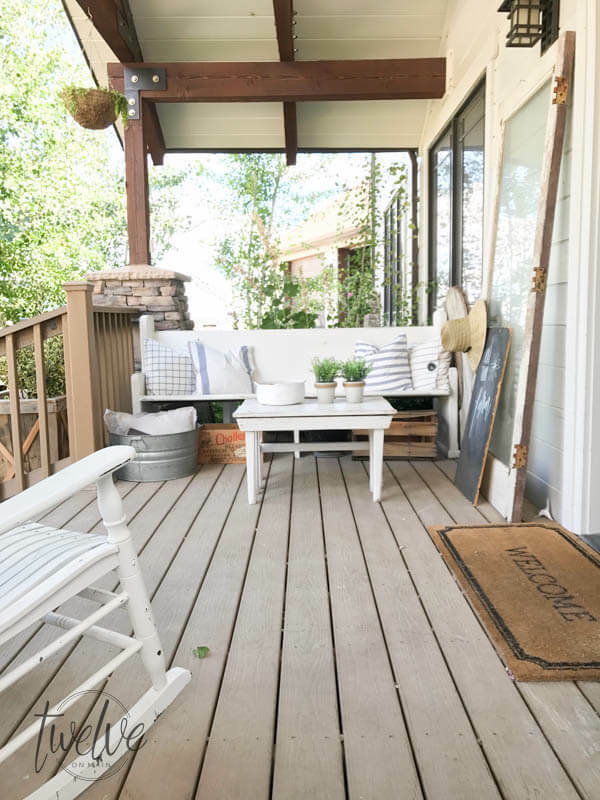 We spend a lot of time on our front porch and our back porch, and there is nothing like kicking up your feet and enjoying the surroundings. Especially when our summer evenings are so freaking lovely and awesome. 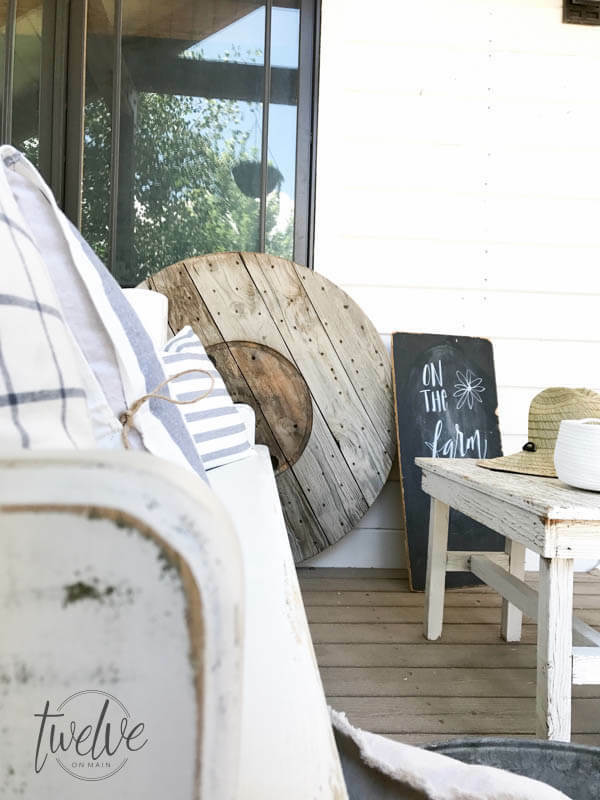 Why I love my farmhouse style painted church pew. Well, isn’t it obvious? Its just freaking amazing! There is something so exciting to me about finding an old piece like this. With any old piece of furniture, I imagine what its life must have been like before landing in my lap. For my church pew, I imagine how many families had sat on this bench, trying to keep their little children quiet as they tried to worship in their faith. I imagine the young married couple holding hands, starting a new life together while centering their marriage around their religion. I see the lonely old man that has recently lost his beloved wife, mourning in an empty church pew, a place where he can find safety and comfort. I don’t know if any of these things ever happened, but I like to think that they have. Because now, I can add our memories to this old church pew. Maybe me and my hubby, sitting out here watching our kids ride their bikes in front yard. Maybe a couple of kids, hanging out, eating popsicles on a warm summer day. Maybe a heartbroken mom and dad, sitting here after we send one of our kids off to college. The memories are endless. 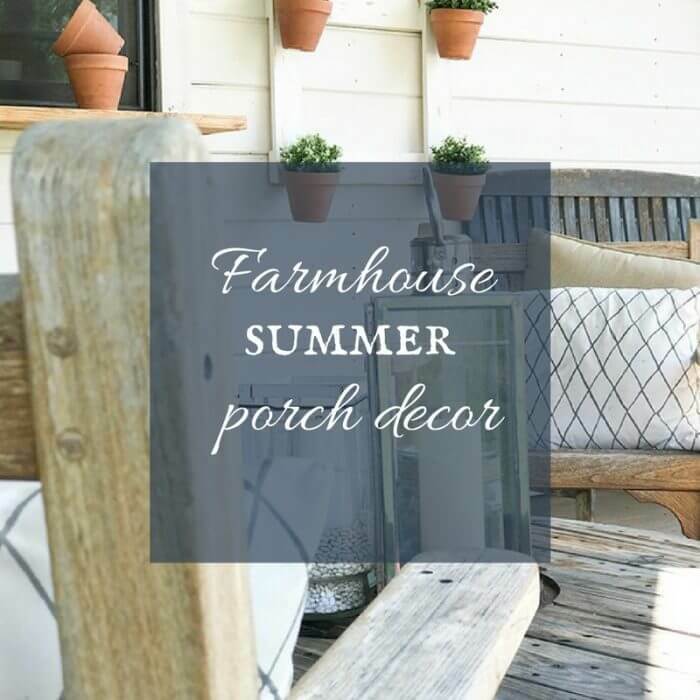 My farmhouse style painted church pew is not just a piece of furniture. It is a connection to the past, as well as to the future. Hopefully one day, someone else will be able to add their memories to this beloved piece of furniture. I know I look forward to adding mine. 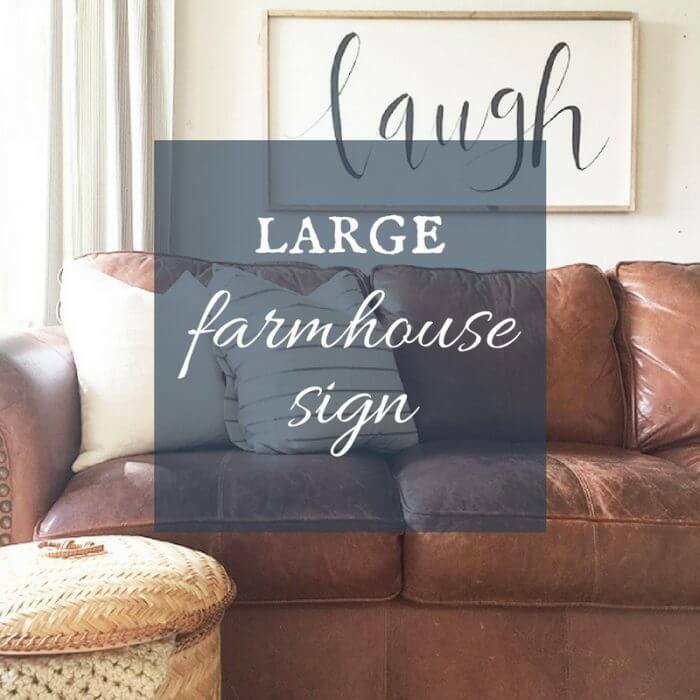 Do you have a piece of furniture in your home that has been passed down? Have you found an old piece that seems to have cool stories behind it? I would love to hear about it! and make sure you save this for later! 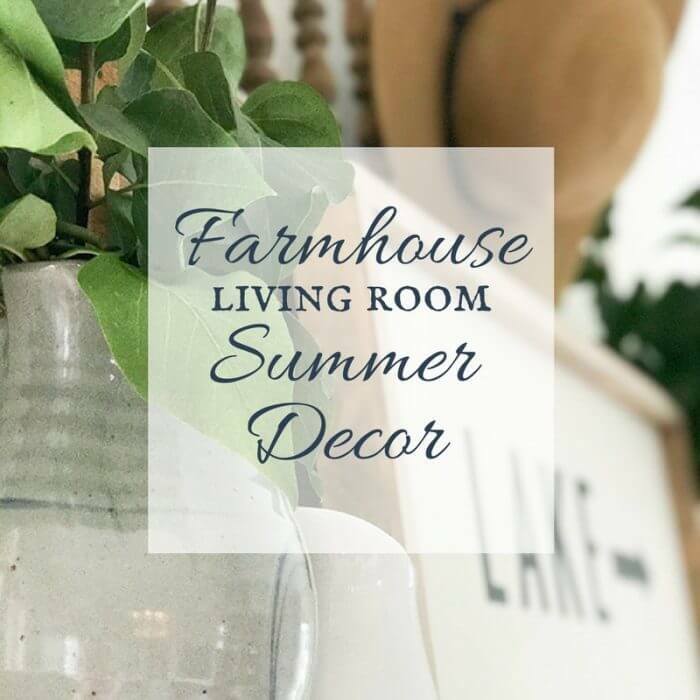 If you like this post, check out some of my other favorite farmhouse style! I have always wanted an old church pew too but have never had the space to put one. I do have an old table my Grandfather made in shop class. I have thought about painting it (it’s stained brown) but I’m torn about changing it. I think a nice coat of white and then distressing to show a little of the old color would bring new life to it. One day maybe (deep sigh). I know how you feel about painting an heirloom piece. My great grandfather build the coolest toddler bed, and I have it in my home. It is so lovely with the raw wood finish, I don’t think I would have the heart to paint it! Love the church pew. 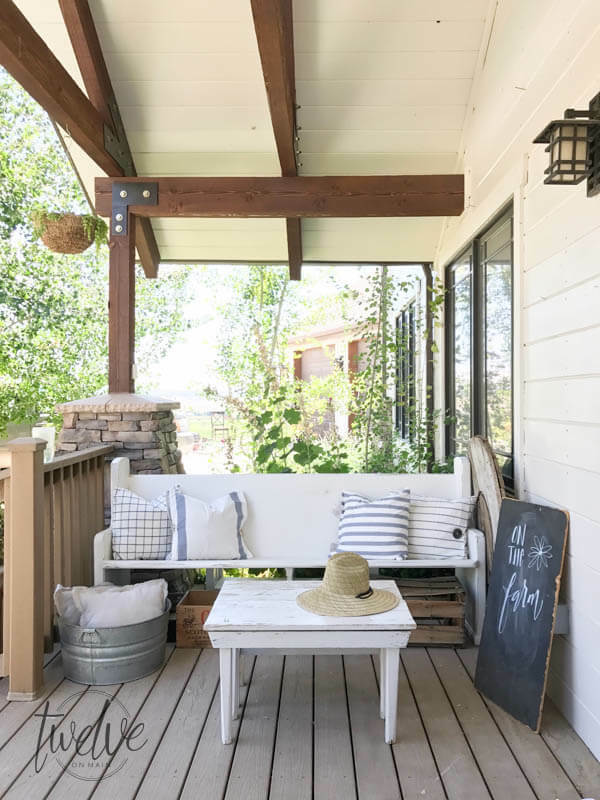 I wish I had a front porch. I like to fine a small one for my entry way. Love your site. I was so exited when I went junking and found a 1974 scale. It had the warranty tape to the bottom. After I cleaned it up it looked new. I have been wanting one for so long. So I do know how you feel. How cool! Id love to come across an old scale like that! I wish I could find one. Had ones years ago and had to leave it behind when we went overseas.. Love it. I love your church pew and have always wanted one myself. I think your paint color is perfect and your pillows. The worst time for parents is between college and that first grandchild, then you smile all the time. lol!!! Ah! That is what I hear! I will enjoy them while they are all still in my home! Hope to see you & your creativity at the party! Oh good luck! I hope you find one! I’ve had that dilemma before where you want to try something new but your gut instinct just says a piece of furniture has to be a certain color. I find that I am happiest when I listen to my first gut instinct. The pew is beautiful! 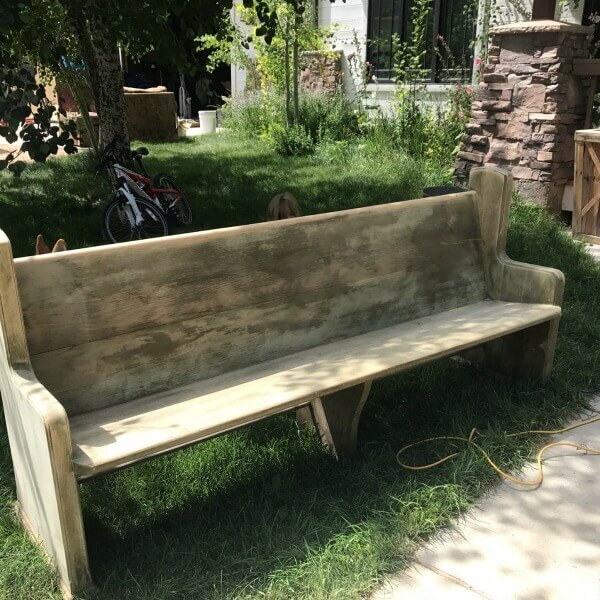 Great job on your antique church pew! I think painting it white was a good choice. You can always add pops of color with throw pillows. 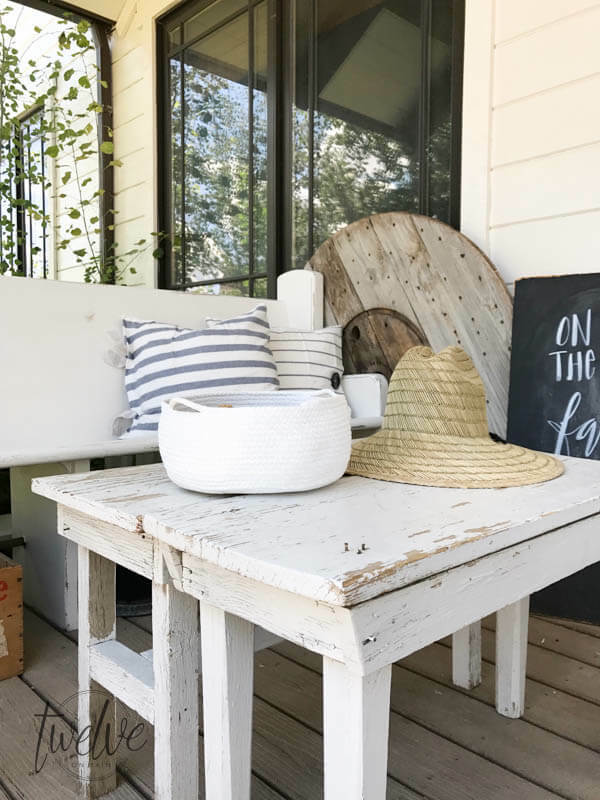 It’s perfect on your porch! Thank you so much! I really do love it! A church pew has always been on my wish list!! It looks gorgeous! Hello, would you mind telling me the colour you used for the pew?